The 50s and 60s were an amazing time for popular music. Everything felt fresh, everyone wanted to try new things, and – best of all – the people that funded these ventures were willing to take risks and nurture innovation. It was a democracy that held that, if you had the skills and wanted to work hard, you could take a reasonable stab at the music business. It was indeed a business, but, importantly, it was about music, and the people in the business were, by and large, musicians. Many of the creations from that time survive alive and well today in the form of songs we still listen to and tunes we still whistle. It’s a testament to the time that today’s youth returns to that era, not only for simple listening pleasure, but also for sampling and turning it into something contemporary. But, while the songs themselves are the overt legacy of those times, there is more to a classic recording than just the artist, lyrics, and orchestration. There’s the technology that was used to get it all on tape. This was no less an innovative time for recording technology than it was for songwriting itself. Seat-of-the-pants engineers were learning as they went, trying this and that, with their ears as their ultimate guides. There was no EDA, there was no verification plan; you just did what you needed to do. One name that looms large from this era is that of Bill Putnam, Sr. – credited by colleague and producer Bruce Swedien as being “the father of recording as we know it today.” He invented the modern modular recording console and had a role in the development of stereophonic recording. The “firsts” he’s accorded include using echo chambers for reverb, the multi-band audio equalizer, the use of tape repeat, over-dubbing voices, and the use of delay lines. He wasn’t just an equipment designer – he was a producer/engineer. He was simply making the equipment he needed to get the sound he wanted. He’s known for having produced the recording tools that shaped the sound of folks from Frank Sinatra to Patti Page to Ray Charles, giving them a characteristic warmth. Bill Sr. passed away in 1989, and, as the story goes, his sons Bill Jr. and Jim were cleaning out his workshop when they stumbled onto his old design notebook. Those well-worn pages, along with Bill’s Stanford EE doctorate and association with the Center for Computer Research in Music and Acoustics, led to the reincarnation of one of Bill Sr.’s equipment companies: Universal Audio. Which leads naturally to the question, what exactly is the “sound and spirit of vintage analog technology”? How do you bottle it and sell it? Can it be parameterized and codified and programmed? Or is it something more subtle, ineffable? If the new generation of Putnams is replicating the past using modern technology, how are they capturing things like the legendary “warmth” of the old boxes? I don’t recall seeing “warmth” as one of the figures of merit of an analog circuit. With this question in mind, I got to have a conversation with Universal Audio’s Chief Scientist, Dave Berners, joined along the way by Product Manager Will Shanks, who has a unique role in the verification cycle – more on that later. The conversation happened, naturally, in a recording studio onsite. In fact, I’m pretty sure this was the first time I’d been inside a recording studio. Surrounding us were the units that had made the original Universal Audio famous. Loose conversation with Universal Audio folks as well as the marketing materials tend to refer to “algorithms and DSP engineering” as the key to what they do now. But that doesn’t really say much – the question was, engineer to engineer, how do you go about replicating the finer nuances of old audio equipment in a modern milieu? The “plug-ins”, which are all-digital boards that plug into a rack that connects to a computer via modern technologies like PCI Express and Firewire. These may include new features that would have been hard to implement in older analog technology. While the first two groups have more of the burnished, awe-inspiring look of vintage equipment, it was really the plug-ins that I was interested in from an engineering standpoint, since these are intended to take old-world functionality into the digital era. We talked about the different approaches one might take to doing this. The “obvious” academic approach is simply to mimic the response of the original machine. Put overly simplistically, this would be like treating the thing as a two-port, measuring the transfer function, and recreating that with a DSP. But, back here in the real world, there are (at least) two fundamental issues with that. Technically, it could work – if the entire system were linear (and, problem number one: it’s not). But, even then, you don’t have just a box with inputs and outputs: you’ve got controls on there too. So – problem number two – you’d have to characterize an enormous design space that captured all of the possible combinations of all of the controls (many of which are continuously varying). Rather than treating the whole box as one big “function,” another approach might be to break it into op amp stages and model each of those stages. But this also has significant drawbacks. First, many of the boxes are hard to decompose this way, even if you were to ignore the huge design space you had to model due to the controls. You’re also faced with the problem of interpolation for the points you don’t measure. And this is key: not only are these systems not linear, but the non-linearities can play an important role in the characteristic sound reproduction qualities – these are the very things you’re trying to reverse engineer. If you interpolate wrong, it sounds wrong. If you don’t want to have to interpolate as much, you have to measure more points – but that just makes the design space issue that much worse. So the approach they landed on was to start with the schematic to build the model, but to characterize the actual circuit behaviors. There’s a subtle difference between this and the prior approach: here there’s no specific attempt to turn everything into an op amp stage; it’s a much more ad hoc process, even as they developed specific proprietary techniques. It’s physical modeling rather than mathematical modeling. This method isn’t without its own challenges, not the least of which is the fact that you start with the schematic. Which ought to make things easier, but, as usual, reality trumps theory. It bears mentioning here that the new Universal Audio has gone beyond just replicating old Universal Audio equipment. By request or just by strategy, they also rejuvenate equipment from other companies. So they have to look at a variety of old boxes and come up with schematics describing how they work. For the most part, they do this with permission and under license from (and possibly paying a royalty to) the original company, meaning that they usually get cooperation – and sometimes even collaboration. They can’t find the schematic. The one they found is not the latest rev. There’s some critical illegible scribble or smudge on the schematic. The guys that originally worked on this stuff are no longer around. They can’t reverse engineer from the board because you can’t get at some of the parts (which were occasionally even encased in tar). This is the ultimate in “legacy code,” from a time when we didn’t have design management or configuration management or any of the other processes we now spend good money on to keep this from happening in the future (and which still don’t keep us from being petrified of legacy code). Dave described a situation where they found a schematic online. And they weren’t the only ones to find it – other companies also do reproductions (although, according to Universal Audio, typically without the blessings of the original companies). So more than just Universal Audio had pulled this schematic down and were trying to make a digital replica. But the result they got just didn’t sound quite right. Neither they nor any of the other companies trying to make it work were getting it right. There was talk about the issue perhaps relating to some special characteristic of the transformer that was used in the original. After much gnashing of teeth, the Universal Audio guys found that there was actually a mistake in the schematic: two resistor values were swapped. Without bragging publicly about their find, they were able to go to market with a better-sounding version than their competitors (and were validated later when they got the correct schematic from the original company). All of which is to say, having schematics isn’t enough to get them out of the woods. Once they get a schematic that they think is reliable and one of the boards that the schematic describes, they characterize each of the various components using a sophisticated set of input tests (which, naturally, they didn’t divulge). Getting access to the points on the board where they need to drive inputs or measure the response isn’t guaranteed: the signals are often observable, but not always. When characterizing these components, you’d think that nailing the frequency content might be enough to say you have mimicked the system, but it’s not that simple. In particular, gain evolution has to be accounted for. In a classic circuit, an amplifier has a fixed gain. Not so in some of these components: the gain changes at a subsonic rate, and it’s important to replicate that behavior – which requires special tones to do. And which also means that the person studying the schematic has to be able to recognize those parts of the circuit that may exhibit gain evolution. Once they’ve done all this work and built the model, then they can proceed with the digital implementation, which is where the process re-enters standard DSP engineering. You’ve got to wonder whether, in the future, there may be some automated way of doing this. One example approach is called “dynamic convolution,” but it primarily works for linear and memory-less non-linear systems, and it doesn’t account for the control space. It works fine in its domain, but audio equipment doesn’t necessarily confine its behavior to those characteristics. In general, Dave says they are open to automation – if it’s robust enough. Having completed the design and built a box, they need to test it, of course, to see if it passes muster. And this task is also tough, given what they’re attempting: they’re not just trying to build a box that does something; they’re trying to build audio equipment that sounds like the originals from which they were derived. So hardware testing is fine, but it only goes so far. And that’s where Will comes in. He’s not an engineer; he’s an audio guy. He brings a specialized piece of testing gear: his ear. Will provides the human sanity check where machines no longer suffice. He has a battery of music clips that he uses (think of it as an audio regression suite), and he sits there with the original and the replica and an A/B switch and just listens. And if there’s an issue, engineering listens. Will and Dave have worked together for a long time and have developed a language for describing the various characteristics that are or are not being successfully achieved. That collaboration and trust are critical to making sure that the human testing gets taken seriously and that problems will be fixed. This interplay between the strictly technical and the more nuanced human side of things seems to be characteristic of the company, judging from the few people I talked to. While their office space is a mix of cubes, offices, and production space (plus the studio), all in a low-slung building typical of any industrial park, what sets it apart is the unusual number of music posters you see all around. This is a dream job for musicians: many of the people working there are musicians; one guy I talked to is in two different bands. Obviously they keep their day jobs, but I can’t deny feeling like there was some kind of something extra going on – almost a reverence for what they see the company doing. I suppose that could have all been an act for the press guy, but, then again, I had more than one conversation over beer – and beer makes it harder to maintain the corporate line if you don’t believe in it. It seemed pretty genuine to me. Yes, they’re in business, yes they need to make money – but there’s an overarching aesthetic. It’s this aesthetic that keeps this from being a simple job of reverse-engineering boards and cranking out units. We’ve poked fun at audiophile excess before, but these folks appear to be serious about their sound. There’s a huge amount of analog black magic that is still required to get to the point where you can do the digital design. They may point to their DSP skills as the key; I’d argue that, by the time they get to the DSP, they’ve already done the work that will differentiate their sound from that of their competitors. The results of those efforts play out in digital boards for a PC environment that have a role in the rebirth of a more democratic music business. Having had all the creativity squeezed out of it by the music behemoths for a few decades, personal computers and the internet have given some power back to the individuals that actually make the music. Just as Bill Sr.’s systems helped to fuel popular music a half-century ago, the efforts of his sons are feeding the needs of today’s music producers, whether through an expensive “Classic” in a studio or a more affordable digital plug-in for a garage setup. It helps to put music back in the hands of musicians. 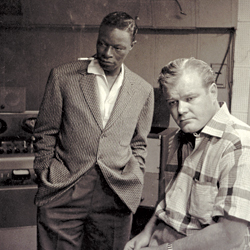 Photo of Bill Sr. and Nat King Cole, courtesy Universal Audio. Have you tried to resurrect history in the form of old circuits or systems before? Any good stories? Any good tricks?